CARPE DIEM: U.S. Manufacturing Productivity Soars to Record Level: Output per Worker of $300,000 in January! U.S. Manufacturing Productivity Soars to Record Level: Output per Worker of $300,000 in January! According to Table 9 of today's Federal Reserve report, the Gross Value of U.S. Manufacturing Output reached $2,776.5 (almost $3 trillion in billions of 2000 dollars, and close to $3.5 trillion in today's dollars) in January, the highest level since December of 2008. According to BLS data, there were 11,540,000 manufacturing workers in January, which means that on a per-worker basis, U.S. manufacturing output per worker was more than $240,000 in January (measured in 2000 dollars). 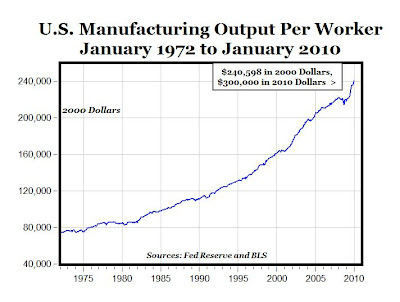 Converted to today's dollars, that's about $300,000 in manufacturing output per U.S. worker, and the productivity of America's factory workers has doubled in less than two decades. U.S. manufacturing is surging again by every measure (industrial production, ISM manufacturing, Empire State index, etc. ), and yet that increased manufacturing output is being produced with fewer workers - about a million fewer than a year ago - raising U.S. manufacturing output per worker to the eye-popping level of $300,000 in January! Perhaps that's one positive outcome of an economic slowdown - it motivates companies to produce "more with less" as they are forced to focus on cost-saving efficiencies, resulting in the soaring productivity numbers reported here. One must now ask, when will the pay rate rise to match? If business owners aren't careful, could result in a renewed interest in unions. What are the costs imposed on the employer by local, state, and federal government laws, regulations, and paperwork? Just think how wealthy we might all be if it weren't for the trillions of dollars spent every year on empire, dole, and largess. worth considering here is that this may be the result of high labor costs. if labor is expensive, you substitute capital. this raises productivity. but in many industries, there's just not a lot of need for new manufacturing labor. sure, you can add people to the lines at ford or Boeing, but at a company like intel, you just don't need them. the $ output per employee of an intel line is staggering. at the end of the day, this is a good thing. we have shipped lots of manufacturing overseas for a good reason: there's no profit in it. consider a PC. who makes all the money? intel, microsoft, and maybe a bit for the assembler/marketer (like dell). the manufacturers of the casing, the drives, the memory, the peripherals, they all have zilch. they are terrible businesses. the key to being an advanced economy is staying advanced. that means always moving toward the technical edge and away from what is becoming commoditized. we should welcome shipping profitless manufacturing overseas. it means we are maintaining ourselves as an advanced economy. it is precisely that we exit such failing businesses that keeps us competitive. Anonymous, This increase in productivity may be due entirely to capital improvements like better tools, machines, and processes. The labor component may not have increased in value, so the worker shouldn't expect to get paid more. In other words, if no higher skill is required to do the job, it shouldn't be worth more. Worker productivity has been rising nicely in manufacturing for many years. However, I disagree worth those who say only certain industries are worth keeping in the USA. Often, we hear that "high-tech" industries are worth keeping. But making nails can be high-tech, if advanced capital equipment is deployed to radically increase output per hour. Other nations follow mercantile policies with great result, China being a notable example. Not sure the free trade argument bears fruit in real life. Everybody says US farmers are the best in the world. Also, subsidized tot eh tune of $60 billion a year, and aided by 7,000 Department of Agriculture extension officers, and a whole panoply of ag schools, regulations and trade barriers. Why is a policy so revered in right-wing circles--free enterprise-- never applied to the ag sector--indeed, why are farmers routinely lionized in right-wing circles as the best and most productive on Earth? If it works for ag, could it work for US manufacturing? If not, why not wipe out ag programs? Tell me that China's Mercantilist policies are successful AFTER they have to find some way of spending their billions of US dollars. Gross output might include the value of parts imported into the US for assembly. For instance, if the drive train of a car is built overseas and imported into the US where it is assembled into a vehicle, the ENTIRE value of the vehicle, not just what was produced in the US, is counted. This distorts productivity measure. That tends to happen when you aren't hiring anyone, your workers are scared to death of losing their jobs, and you get a temporary inventory bump. This is not good news. It's typical of prolonged recoveries and dead cat bounces. ...and all the Third World junk that goes in it. There are no unions to kill in farming. That should be the other way around - they should fear that their workers could go to another company. However, with regulatory evasion to offshore countries, that tilts the equation away from the worker. If output is so high per worker (I don't question this) then why would companies off shore production? Other countries, notably China, require joint ownership of manufacturing facilities in the host country to access that market. The off-shore manufacturing facility also gets to enjoy the export subsidies of the host country for their products. The result is a nebulous chance at foreign markets but guaranteed tech and trade secret transfer. Gettingrational, from what I understand, companies are generally not off shoring production if you consider that in shoring exceeds out shoring. I can't find a link at the moment, but I recall that insourcing generally exceeds outsourcing. I believe this applies to both the manufacturing and service sectors. Don't forget that the U.S. is the worlds leading manufacturer, by a long shot. Regarding pay rate, I also recall reading that rate of pay has risen significantly when you consider benefits as pay. I need to keep those links! Here is an old link, but a good one. > Not sure the free trade argument bears fruit in real life. Then you don't understand the principle of Comparative Advantage. > That should be the other way around - they should fear that their workers could go to another company. Why? As usual, seth, your blatherings make no sense at all. It's not good if EITHER side, the worker OR the employer, has a notably significant advantage, because then the result is that one will "oppress" the other. What has happened to the US-based auto industry in the last 50 years is a prime example of what happens when the worker has a significant advantage -- the employer is force to make ruinous concessions to the employee. The other side, when the employer has all the advantage is rather obvious, I assume. And the inherent flaw in all of this is the adversarial attitude involved. The employer and the employee should see each other in a positive and symbiotic light, because that is what they are, a symbiosis. Both need each other and both can thrive best when the other is also thriving... and while it is quite possible for one to be thriving at the others' expense, such a situation cannot hold for long in real terms. This is not the current view of business by the employee, unfortunately, and leads to the current bad situation where the employee is out to get whatever they can, despite the fact that the long-term effect is that of killing the goose laying the golden eggs. A union without an employer doesn't make a dime for its members.